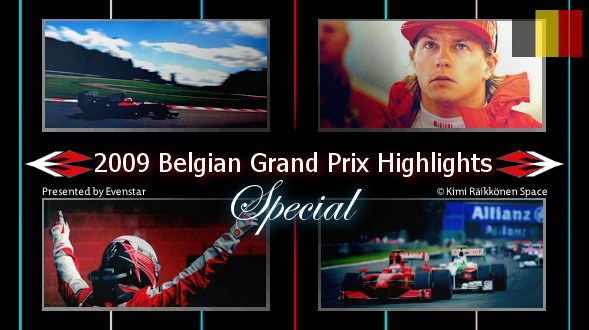 Catch the hottest and latest Kimi related videos on YouTube and Vimeo. Don’t miss videos on the blog! The KRS Grand Prix highlight videos were created specifically for KR fans. In an unique movie style with captivating soundtracks, the videos tell every stage of Kimi’s race weekend in it’s own story, full of track footage action as well as fantastic images from behind the scenes during the F1 weekend. Some videos reached over 1000 downloads each. As well as entertaining, these videos are a great archive of Kimi’s recent career at Ferrari and remain a must-see for all KR fans old and new. Excelllent Job with this page mate! dont know how I didnt come across it earlier! Ahh.. nice to see you also transferred your videos here too. I’ve lost ALL data on my computer last December, and it’s great that I’ll be able to re-download these. Well.. I can reupload them when they expire, but I need to have them all first. How fast is your connection? I Hope that you can re-upload the 2007 season review 🙂 and are you planning to make a 2014 return to Ferrari video?